Diminished ovarian reserve occurs when the estimated quantity of oocytes, or eggs, in a woman’s ovaries is not the expected number for her age. Most women experience a significant decline in the quantity of oocytes in the third decade of life; for some women, this decline begins earlier. A diminished ovarian reserve that occurs before age 35 can indicate premature ovarian failure. A woman’s lifetime supply of oocytes develops before birth. At approximately 20 weeks before birth, a female fetus’ oocyte count is at its peak, at approximately 5 million to 7 million oocytes. By the time a girl reaches puberty, that number — which has been declining rapidly —falls to approximately 500,000. With each menstrual cycle, the quantity of oocytes continues to decline at a rate that is genetically predetermined for each woman. A diminished ovarian reserve is usually caused by a genetically predetermined loss of oocytes; however, other causes exist. Certain conditions, such as being a carrier for a condition called Fragile X, can cause premature ovarian failure. Other conditions, such as endometriosis, can damage or destroy ovarian tissue. Diminished ovarian reserve also can occur as a result of ovarian surgery, which may include removal of some normal ovarian tissue. In addition, cancer treatments, such as chemotherapy and radiation therapy, can result in a diminished ovarian reserve. Evaluating ovarian reserve is an important element of fertility evaluation because a woman usually shows no indications that she has a diminished ovarian reserve. One of the most common evaluation methods involves obtaining a serum follicle-stimulating hormone (FSH) and serum estradiol sample on Day 2, 3 and 4 of the ovulatory cycle. An FSH greater than 10 mIU/ml indicates a possible reduction in ovarian reserve. Our Ovation Fertility lab team also may test for Anti-Müllerian hormone (AMH) levels. AMH is produced by primordial cells in the ovarian follicles. The AMH level is related to the ovarian reserve. This blood test can be performed at any time during a woman’s menstrual cycle. In addition to blood tests, our partner fertility specialists often perform antral follicle counts. This transvaginal ultrasound examination, performed during the first few days of a woman’s ovulatory cycle, allows physicians to count the number of small resting follicles. 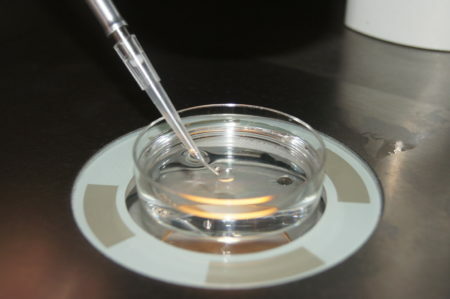 An evaluation for diminished ovarian reserve tells our team whether a woman has the appropriate quantity of oocytes for her age, but it does not indicate the quality of these oocytes. Oocyte quality is most affected by age, so we encourage women who are considering a delay in pregnancy to discuss with our partner physicians their options for getting pregnant. This may involve egg freezing, or IVF. In some cases, donated eggs may give the best chance for a successful conception. If you have a family history of diminished ovarian reserve or have experienced difficulty getting pregnant, contact us today for more information.